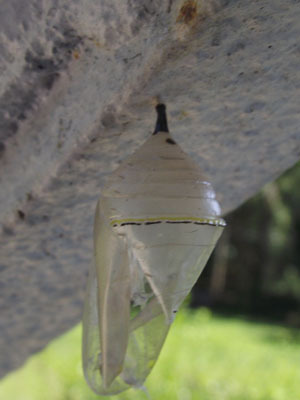 I could say it started with a chrysalis, but it didn’t. I could say it started with the first warmth of the season and a Greater Fritillary dancing towards my seat on the front porch. But it probably truly started in Chilmark, Massachusetts, when I was doubly dazzled with a blooming buddleia and clouds of monarch butterflies. I carried that memory with me off the island, and back to New York. I did not forget. We moved to this house two years ago, sad to have left our restored home of 15 years. But each time I stepped outside, the sun washed over me and I realized what this might mean: a garden. A garden that could thrive because of the beautiful sunlight that arrived first thing in the morning, and lingered until late in the afternoon. Enter the echinacea, hyssop, black-eye susans, and yarrow. Hello to lavender, thyme, and the aggressive monarda. 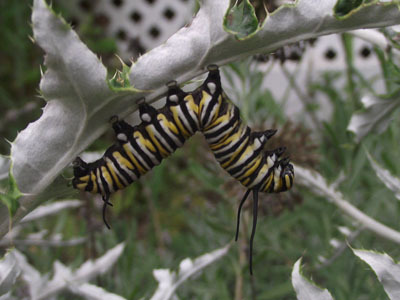 And a loud boisterous “C’mon In!” to the milkweed plants. I found a pink variety. I love every bit of them, in every season, even this gangly autumnal season of seed. The butterflies came. The fritillaries and the chipper Painted Ladies. 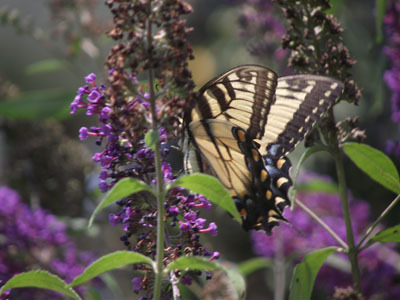 We had yellow swallowtails all over the purple buddleia panicles, and the occasional black swallowtail. Here and there, a monarch. Not nearly as many as I remembered from Chilmark, and not nearly as many as are reported by Dear Friend in Brooklyn (who has a two-story tall buddleia behind her Brooklyn apartment building — proving once again that New York City is indeed the Capital of Everything, including the winged-variety of Monarch! ), but enough. Even one monarch, if you catch a long-enough glimpse, is enough. As cheerful as the blossom she alighted on, the Painted Lady poses. A tangle of stars? 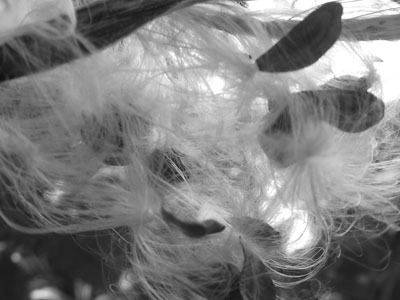 Closer to home: a soft tangle of milkweed seeds. 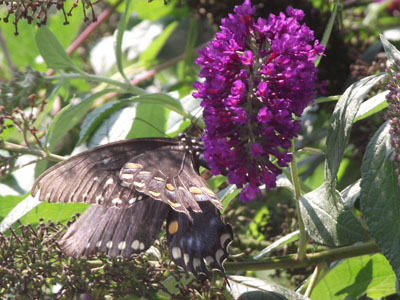 A black swallowtail on the buddleia colored like a popsicle. 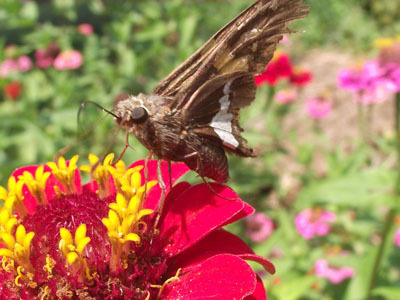 We see so many yellow swallowtails, and it is still not enough. And late in the season, we saw the caterpillar, on the underside of my blue globe echinops, seeming to fly even while firmly anchored to the stem. And the evidence of flight, of the beauty of release. Sailing a sea of metaphors, I could go on and on and on about caterpillars wrapping themselves in a chrysalis of growth and discovery, changing into a beautiful butterfly that flies away. Leaving me. But anyone who has ever loved knows this. Every parent understands, anticipates, dreads, and revels — to our core we know this truth. It doesn’t make it any easier. But it is a pretty process, and one that will hopefully be appreciated in all of its profound simplicity.